About Pinnacle Performance: Strategies for the Office Environment? Pinnacle Performance: Strategies for the Office Environment is a software program designed to reduce the risk of musculoskeletal injuries for office based employees. It allows workers to self-manage their office environment by following relevant and easy-to-read advice on workplace ergonomics and manual handling. What does Pinnacle Performance: Strategies for the Office Environment include? General Information on anatomy, exercises and ergonomic workstation layout. Step-by-step instructions to demonstrate correct manual handling techniques (for example: using compactus, handling archive boxes, loading vehicles) are also available. Targeted Advice where workers can use an interactive Pain Chart to select the area they experience aches and pains and receive relevant self-management and workstation ergonomics strategies to help them alleviate their symptoms (Note: this software DOES NOT take the place of medical advice from a Doctor, Physiotherapist or Health Professional). A Workstation Checklist program enables workers to assess their own workstation to ensure it is appropriately optimised. The program recommends any workstation modifications and equipment as required. Three Ergonomic Quizzes and a Questionnaire enables Supervisors/Managers to monitor worker knowledge. Results can be emailed to a Supervisor/Manager for review and discussion. Pinnacle Performance is suitable for both small and large organisations and is accessed via a password protected website. Stay up to date with the latest information with Pinnacle Performance? Printable “Technique Prompts” within the “Work Practices Section” provide workers with easy to follow best practice manual handling technique guidelines. How can Pinnacle Performance be integrated into the workplace? At induction, workers can use Pinnacle Performance as a training resource, before completing the Questionnaire and Quiz 1. The results can be emailed to a Supervisor/Manager to indicate completion of the ergonomic workstation induction process. When commencing work at a new workstation (i.e. starting employment or relocating desks), the Workstation Checklist should be completed, printed and then the results discussed with a Supervisor/Manager to determine any necessary interventions. 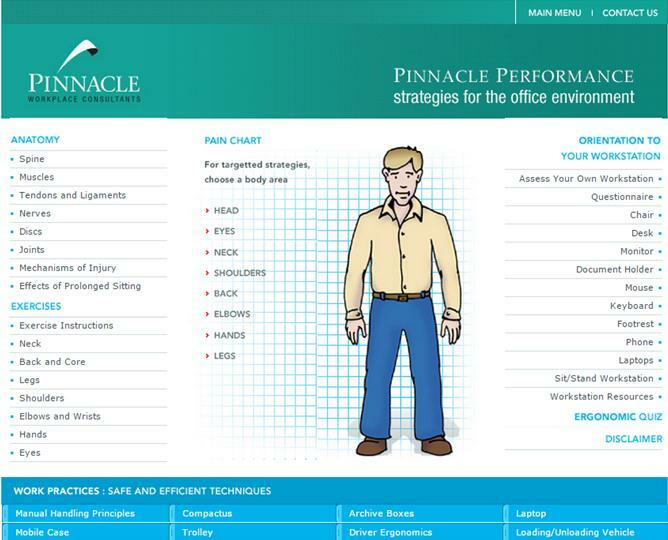 Worker performance reviews can incorporate completion of the Pinnacle Performance Quiz to ascertain worker office ergonomics knowledge. To ensure continual integration of workstation ergonomics into work practices, regular scheduled use of Pinnacle Performance is advised. As an ongoing resource, as the program can be accessed using your company specific username and password via the SUMMIT website at any time. First year access, inclusive of set up fee, is $349 (ex GST). Ongoing annual access fee is only $99 (ex GST). This annual fee is inclusive of all ongoing software and content updates.